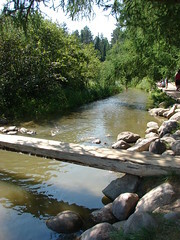 The mighty Mississippi River starts in Minnesota, at Lake Itasca. Every kid in Minnesota has to make the ritual pilgrimage to Itasca State Park at some point, where wading across North America’s longest river is a rite of passage. One of the very interesting things in Itasca State Park is a section of forest that is fenced off so that deer cannot enter it. It’s part of a decades-long experiment to see how forests are affected by browsing herbivores. What’s really interesting is that not only are the quantity of plants different inside the protected area, but the types of plants and trees are different, too. Because deer prefer to nibble on younger trees, fewer saplings survive in the main body of the forest than in the fenced-off portion. Outside the fence, the distribution of tree size and age is biased toward older trees. The population of trees is weighted more toward resinous species like pines, which deer prefer not to eat. Inside the fence, more saplings survive into young maturity, so you see a more even distribution of tree ages and a wider diversity of species represented in the mature trees. The changes in the canopy affect the ground cover which, in turn, change how deer could (if allowed) reach the trees and browse them. Most physical and biological systems are like this in several ways, particularly relating to feedback. In our artificial systems (electrical, mechanical, symbolic, or semantic) we build in feedback mechanisms as a deliberate control. These are often one dimensional, proportional, and negative. In natural systems, feedback arises everywhere. Sometimes, it proves to be helpful for the long-term stability of the system. In which case, the feedback itself gets reinforced by the existence and perpetuation of the system it exists within. In a sense, the system adapts to reinforce beneficial feedback. Conversely, feedback webs that cause too much instability will, like an overly aggressive virus, lead to destruction of their host system and disappear. So, we can see the constituents of a system co-evolving with each other and the system itself. The old “microphone-amplifier-speaker-squealing” example of feedback really fails here. We lack both language and metaphor to really grasp this kind of interaction over time. In part, I think that’s because we like to separate the world into isolated components and only talk about components at a single level of abstraction. The trouble is that abstractions like “level of abstraction” only exist in our minds. Here’s another example of coevolution, courtesy of Jared Diamond in “Guns, Germs, and Steel”. I’ll apologize in advance for oversimplifying; I’m devoting a paragraph to an argument he develops across entire chapters. At some point, a group of nomads decided that the seeds of these particular grasses were tasty. In collecting the grasses, they spread it around. Some kinds of seeds survived the winter better and responded well to being sown by humans. Now, nobody sat down and systematically picked out which seeds grew better or worse. They didn’t have to, because the seeds that grew better produced more seeds for the next generation. Over time, a tiny difference (fractions of a percent) in productivity would lead some strains to supplant the others. Meanwhile, inextricably linked, some humans figured out how to plants, harvest, and eat these early grains. These humans had an advantage over their neighbors, so they were able to feed more babies. That turns out to be a benefit, because farming is hard work and requires more offspring to help produce food. (Another feedback loop.) Oh, and this kind of labor makes it advantageous to keep livestock, too. Over time, these farmers would breed and feed more children than the nomads, so farmers would come to be a larger and larger percentage of the population. Just as an added wrinkle, keeping livestock and fertilizing fields both lead to diseases that simultaneously harm the individuals and occasionally decimate the population, but also provide some long-term benefits such as better disease resistance and inadvertent biological warfare when encountering other civilizations. Try to diagram the feedback loops here: nomads, farmers, livestock, grains, birthrates, and so on. Everything is connected to everything else. It’s really hard to avoid slipping into teleological language here. We’ve got feedback and feedforward at several different levels and timescales here, from the scale of microbes to livestock to civilizations, and across centuries. This dynamic altered the course of many species evolution: cattle, wheat, maize, and yes, good old H. Sapiens. This complexity of interaction extends to planetary and stellar levels as well. At some sufficiently long time scale, the intergalactic medium is coupled to our planetary ecosystem. The human intellectual penchant for decomposition, isolation, and leveled abstraction is purely an artifact of the size of our bodies and the duration of our lives.